Accusations of media bias are a hallmark of 21st century political debate in the United States. From claims that the ‘mainstream media’ opposes the Republican Party to hyperbolic accusations of Fox serving as a form of government propaganda, there is no shortage of distrust when it comes to news outlets. It is not surprising, therefore, that the silo effect in media is so strong. For as much as these are prominent discussions today, the idea of biased media is not new. Nor is the idea of the political process being heavily influenced by ideas put forth by partisan writers. 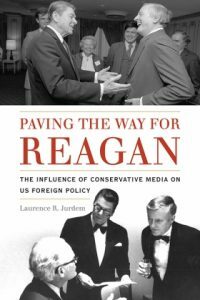 In his new book Paving the Way for Reagan: The Influence of Conservative Media on U.S. Foreign Policy, Laurence Jurdem explores the way in which conservative print outlets shaped conservatism and, in many ways, the Republican Party in the second half of the 20th century. By focusing on three key publications, National Review, Human Events, and Commentary Jurdem demonstrates how conservative commentators sought to influence politicians in Washington by defining a specific vision of American conservatism. With a specific focus on the United States’ international relationships, Paving the Way for Reagan examines how American involvement in Vietnam, China, and the containment of communism were influenced by conservative voices in the press. This is a particularly useful book for this time. As we are inundated with fake news, ‘fake news’, and increasingly partisan media outlets, Jurdem’s examination of these outlets provides a terrific road map for navigating bias in news. An engaging work, Paving the Way for Reagan is a book that illuminates the present through an examination of the past. In this episode of the History Slam, I talk with Laurence Jurdem about the book. We talk about the power of partisan press outlets, the rise of conservative media, and the balance between political influence and commercial success. We also talk about the conservative media’s relationship with Richard Nixon, the Watergate scandal, Vietnam, communism, and Ronald Reagan.